"Guess who's back in the game." After her identity as a Fey branch family member is exposed, Gladys Porter decides to go undercover as a spirit medium. Now that the whole world is aware of her heritage, she is convinced that disguising herself as such will be the last thing "they" are expecting her to do and thus will enable her to hide in plain sight. The plan is flawless and surely nobody will ever see through it. I have the pleasure to present you Adrien Vestigate! This is the best friend of the main character in a future serie that I'm doing (and maybe maybe I will finish it one day! ). As you can see he's a policeman and he really loves his job. He lose his left arm in an attack in a court while he was protecting the courthouse (but I will not say more because it's the base of the universe of my trial). 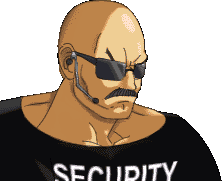 He's a security guard and he's deadly serious about his job. Is intergender, but prefers to be addressed as a female rather than “they”. Used to drink occasionally, once got roaring drunk at the graduation partyXD, but since becoming a nanny dropped the habit altogether. Loves children and despises everyone who mistreats them. Prefers verbal annihilation to brute force, but is not above using the latter. Takes singing lessons from her friend. Her cousin’s an American, yet it wasn’t until middle school that she started learning English. 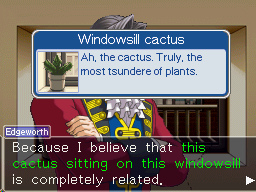 The sole reason being, it seemed like the easiest language the Japanese games get translated to. 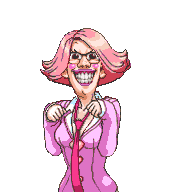 Since I inserted her into the canon world and briefly made Edgeworth's assistant Hannah got fear of crowds solely so that her existence wouldn't contradict nobody being on the prosecutor's side in the courtroom. 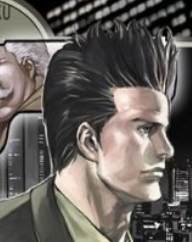 Owes her life to Gumshoe in more than one way. Owns a tamagotchi, collects stuffed toys, manga and anime DVDs. Loves stickers, glitter, glow-in-the dark stuff. 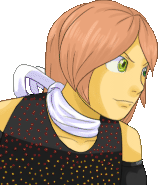 Ladies and Gantlemen, welcome the father of Kristoph and Klavier Gavin... Kurtis Gavin! 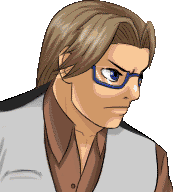 Father of the Gavin brothers, and head of the Gavin & Co. Law Offices during the events of Kristoph Gavin: Ace Attorney. An avid painter and enthusiast of the arts, a trivia buff, and an all-round nice guy (sometimes too much for his own good). 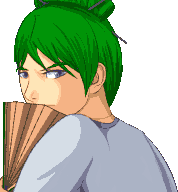 This was actually one of my earliest OCs, dating back to before I even played the Ace Attorney series. 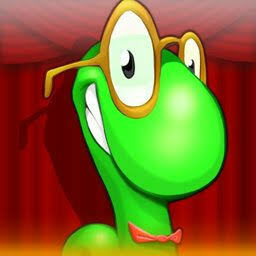 He was obviously quite different at first - he wasn't a Gavin, for one (his original name was Curtis Lycinder). And of course, he didn't sport the Gavin drills. He was originally in a fantasy series that was essentially a ripoff of Harry Potter mixed with Final Fantasy elements. It was terrible, but some of my early character concepts have come with me, and Kurtis is one. In this remake I strove to make him as distinct as possible from the other two Gavins whilst still making him strikingly similar. The addition of purple to his palette (a different shade to his sons) to keep him more thematically in line was used. I also gave him a bowtie to make him a little more distinct from his body base (Apollo). 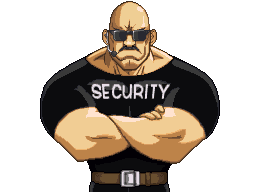 Effort was also made to make him noticably taller and more imposing than his sons. 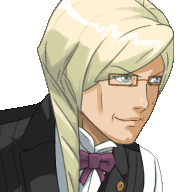 Besides changing details of the face (originally Kristoph's with elements of Klavier added), I also changed his skin tone and made his hair neater than his sons. 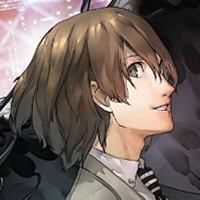 I'd like to think I did a pretty good job establishing his design as his own whilst still making him plausibly canon. A battle for the best of your best OCs! ARE YOU RRRRRRRRRRRRRRRRRRREADY TO RRRRRRRRRRRRRRUMBLE!? ANYTHING GOES THIS TIME AROUND! SHARE YOUR BEST CHARACTER! SHARE THEIR STORY! SHOW 'EM WHO'S BOSS, MAC! 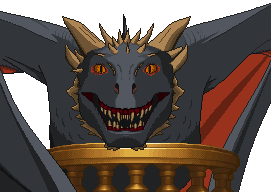 Enter a BRAND NEW sprite of your favourite OC! Try to bring out the very best of them, and share with the community your creations and ideas! If you want, you can do more than a single sprite! An animation, a sprite sheet, a backstory, how they fit into the Ace Attorney universe, all info and extra details are welcome! Last edited by SuperAj3 on Mon Aug 21, 2017 12:18 pm, edited 40 times in total. 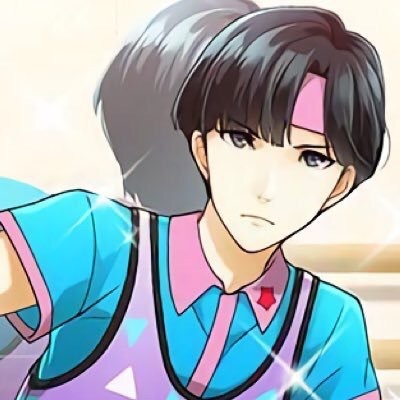 Re: Spriting Comp! OC ALL STAR SHOWDOWN! That's gonna be tough. XD All my faves are supposed to play major roles in cases I'm yet to finish, and their stories are full of spoilers. Hannah's the first character I thought about. Then was Blake.XD Unfortunately, she has the most spoiler-ish background of all. Once I made a grave mistake of uploading it on AAO, but I hope nobody remembers/read it before I deleted it. XD; Also, to be honest, she doesn't quite fit in with the AA-verse. Despite all this I want to enter her really badly. XD There are, in fact a couple new sprites I have in mind for her. I'd have entered with Harmon if it weren't for the fact that I didn't actually do the art for him. That lovely credit goes to MercurialSK. But I'm definitely going to keep a close watch on this one. 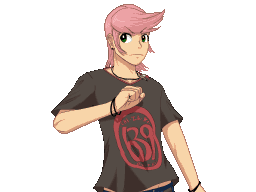 The comp requires a brand new sprite of the OC. So if it's your character, and you make the sprite yourself, it'll be valid! Awesome revamp, I'll update the OP! Could we get this stickied? #support (it probably won't make any noticeable difference but it'd be nice to see this stickied). I think the only way we could get this stickied was if I PM a mod. I just don't know which one is active here? Bolt's usually busy but I think he's the only one. I'm entering for sure. 8D Though I feel like I must ask: can I enter Hannah despite her not being a "conventional" AA FC? Sure! It's pretty much anything goes with this comp, so even if they're not solely an AA fan character, they're still acceptable! I actually have time to do one this round! I'm about halfway through it. It won't be a full set, but I'll get one pose done. "Oh boy, my Kurtis revamp is coming along great. In a couple of weeks I should have it perfect!" I'MMA GONNA EXTEND THE DEADLINE! Right then. This should be interesting. I hope this way everyone that expressed interest can join! That's great news! That means I can procrastinate until August 3rd! 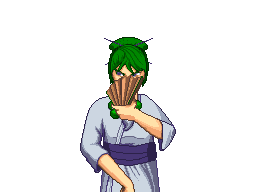 This was a sprite that would have showed up in the rough draft for Conflict of Interest, but I never got around to doing for practical reasons. Don't worry, I already started working on my entry. Oh, boy! If I had more time on my hands, I'd have loved to enter this. Nevertheless, I'm intrigued to see what everyone can create for this. Best of fortune to you all and happy spriting! I do remember seeing her in another outfit, she looks great! Reminds me that I really need to finish CoI one day. May I vote for him already? I initially planned to make a completely different character with more poses, but El Dorado called me... so I had to stick with this guy. Alexei Bogard: He's a security guard and he's deadly serious about his job. He may need a revamp in the nearest future, as his body proportions are a bit off. 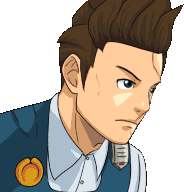 On the other hand, I may leave him with this "cartoonish" look, as not all characters from Ace Attorney have realistic designs (eg. Meekins, Brushel or Delicia Scones). Awesome! Will add to the OP. There's about 26 hours left! If you want I can hold it open until the 6th (so the 5th for most others) just in case.